Complete reinforced and upgraded gearboxes from Systema. Quality parts and thoroughly tested by Systema's technicians, these gearboxes are ready to be dropped directly into your AEG for instant upgrade configurations. Teflon coated parts ensure smooth operation. 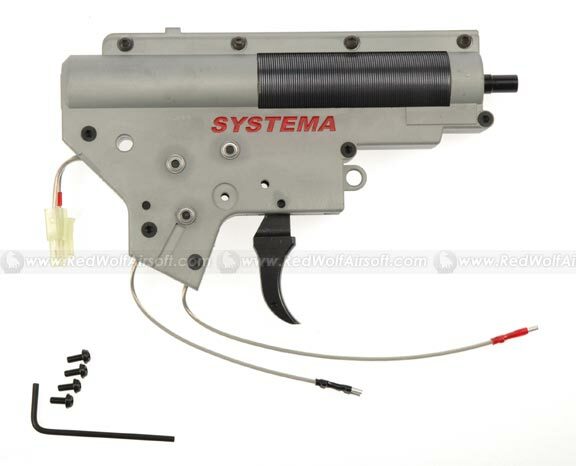 Trust your gun to nothing less than the best in the Airsoft Upgrades Business - SYSTEMA. Note: Installation should be handled by an experienced airsoft technician only. The alignment of the motor on your gun to the first bevel gear must be done correctly in order to avoid stripping the gears on first test. These gearboxes are thoroughly tested to operate correctly before they leave Systema's factory. RedWolf Airsoft will not cover any damages incurred by improper handling and incorrect installation resulting in damage to the gearbox and/or your gun. Please read our article for more information here.